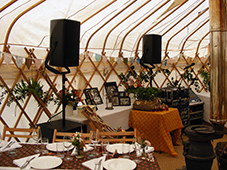 PA hire for weddings is one of our core areas of business, and we take pride in providing exceptional standards of equipment and service for such an important event. The generous comments some of our clients have made emphasise audio quality, service and expertise as areas in which we excel. Our prices reflect our policy of providing best value, and we hope you will be able to get a clear idea of what any of our systems will cost to hire without needing to speak to us. However, we do welcome all enquiries, so if you can't find what you want to know, would like further help in deciding what will best meet your requirements, or wish to check or compare prices, do please give us a call. If the church or auditorium is large, or the main seating area is too small to accommodate all the guests and the sound needs to be relayed to another area, a PA system may be required. A sound system might also be needed if recorded or live music will form part of the ceremony. Our PA systems feature loudspeakers that deliver exceptional spoken clarity, and their high feedback immunity and even coverage allow optimum intelligibility in churches and similar acoustically reflective spaces. Our Announcement System is usually a good starting-point for the ceremony, and can be supplemented with additional radio microphones or other equipment where these might be needed. Alternatively, our flagship d&b audiotechnik Conference System already includes two radio microphones (with any combination of lapel, headset or hand-held transmitters), and may provide a cost-effective upgrade where more than one microphone is required. Each of these systems includes inputs and cables for a laptop computer, iPod or other MP3 player, so can be used for music without the need for additional equipment. Both systems have enough input channels for a small ensemble, so extra microphones can easily be added if musicians will be performing during the ceremony, although in that case our Vocal PA System or another system specifically equipped for live music may include more suitable default equipment. We are often asked to provide a PA system for after-dinner speeches. A system with a hand‑held radio microphone is the most popular option, as a wireless microphone can be easily passed between the Best Man, the Groom, and the Father-of-the-Bride. Our Announcement or Conference systems are again very suitable, although if a dance will follow in the same room our Disco System would probably be our first recommendation. Where a video or photo presentation is planned we can also supply audio‑visual equipment, including DVD players, projectors and screens. Personalised i-Pod disco play-lists are increasingly popular for wedding dances, and the equipment in our Disco System was selected with this purpose in mind. It can also be used for the speeches when the reception meal and evening dance are to be held in the same room, and can be supplemented with a range of DJ equipment, delivering outstanding audio performance with any audio source, from iPod to full CDJ or vinyl production. We can also supply Disco Lights. For live function bands we usually recommend our Small Concert PA System, which can also be used for recorded music - from chill to full Disco - before and after the band, as well as for speeches. However, we have a range of PA systems and options available that will cater for any specific requirements you may have, so please give us a call if you would like further help or information. We can also provide other hire equipment and services, including generators, staging, stage lighting, crew, and event-specific risk assessments. Please ask us to quote for additional equipment or services if an existing package that otherwise meets your requirements does not already include them. 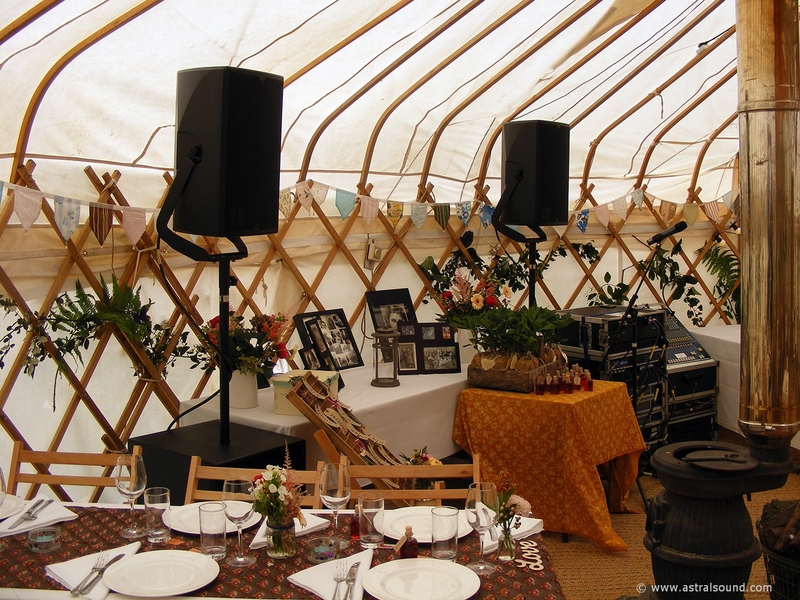 Since 2001 we have provided PA systems - with and without crew - for a large number of weddings, and we will use our experience and expertise to help ensure that nothing in the preparation is overlooked. As well as discussing your requirements with you, we are happy to liaise directly with wedding co-ordinators or planners (well in advance of the day if possible), and to provide copies of any documents the venue may require (such as our public liability insurance certificate, portable appliance test certificates, general risk assessment and/or method statement) in good time and without extra charge. We are also happy to hear from and deal directly with anyone else who needs information from us or who needs to pass information to us, including the Bride or Groom, the Best Man, the caterers or marquee company, the DJ or the band. If we don't already know the venue we can arrange a preliminary site-visit (have a look at our Venues page to see whether we've been there before), and although site visits and other specific additional services are not included in our standard hire charges, we won't charge you anything without quoting for and agreeing it with you first. We are usually able to deliver and set up equipment the day before and/or collect it the day after the event, as this is often the best way to avoid disruption, distraction or worry on the day. In general, we endeavour to provide systems for a single event for a single day's hire charge (regardless of delivery and collection dates), so this does not normally make any difference to the hire cost. If, unusually, delivery and collection will give rise to additional charges, these will be explained and quoted for before you agree to hire from us. When delivery and/or collection must take place on the day itself, we will schedule this to fit in with caterers or other people who might be affected. Delivery to and collection from anywhere within 15 miles of our office is included in the hire price of any packaged system.